After sharing this news with my wife, Regina, we began talking about all the things we remember in the past, that no longer exist. Our list is probably a lot like yours, but I would welcome additions to the list in your comments. During the Summer, I can remember traveling carnivals pulling in and sprouting into life on a vacant lot at the edge of town. 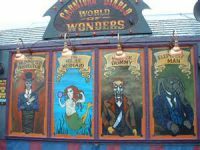 There were bearded ladies, snake charmers, sword swallowers, two headed animals, contortionists, and a wide variety of other unbelievable things to see in the side show. Games of skill and luck, rides of pleasure and fright. Cotton candy and taffy. The Tunnel of Love. Now, I realize that a lot of this can be seen and experienced at various state and county fairs, but it’s not the same as the carnival that came to your own town. Who didn’t love going to the drug store soda fountain for a malt? Then some genius invented something called a “fizz.” You could get a fizz version of just about any drink at the fountain. I’m sure that what ever it was that made the fizz was very healthy. It was probably kin to Alka Seltzer. My personal favorite was raspberry fizz. 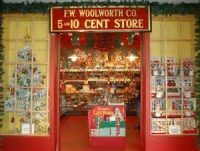 We shortened the name to “Dime Store.” They actually had things that could be bought for a nickel or a dime, or even a penny. Small toys, bubble gum, hard candy, and plastic jewelry. With a fifty cent allowance, a kid could really stock up on some neat stuff. Have you seen one of these lately? 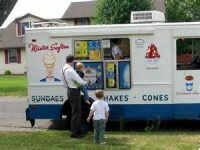 When you heard their happy tune coming down the street, you pulled out your hard earned cash (15 cents) in order to purchase your favorite flavor. Mine was Rocky Road, or sometimes Banana Nut. What a treat on a hot summer day! If you were lucky, your Mom or Dad would buy it for you, and you could save your allowance for other important things. No need to go into the specifics of the lure of the balcony. It certainly wasn’t so you could see the movie better. Enough said. And while we are on that subject, how about those fogged up windows. But there was another fun thing about drive-in movies – $1.00 per carload night. It was amazing how many people we could fit into one car (including the trunk) for a trip to the drive-in on dollar night. I think our record was 15. We were very friendly. And how about those speakers? Every movie experience was enhanced by a cartoon and a serial. Sometimes you might even get a double feature. 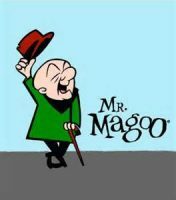 My favorite cartoon characters were Elmer Fudd and Mr. Mcgoo, and my favorite serials were Lash LaRue and Flash Gordon. Now we get infomercials. And that movie experience cost a very small fraction of what we pay today. I know, I know. 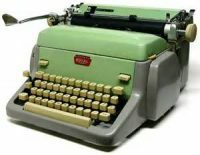 Typewriters have been replaced by computer keyboards, which are much easier to use, but how can a person consider writing the Great American Novel without the clackety-clack sound of the typewriter, the dinging of the bell at the end of the line, and the zip of the carriage return? Have you written yours? Things change, nothing stays the same. Change can be good, but sometimes I still miss some of the things that have vanished with change, like my hair. This entry was posted in Change and tagged carnival, Change, circus, dime store, fizz, freakshow, ice cream truck, movies cartoons, serials, soda fountain, typewriters. Bookmark the permalink. Really good to see the Bear back. Funny … Lash LaRue was my favorite also. But as you know the disappearing circus really hits my heart. You show a picture of the Wallendas’ performing their Magnificent Seven; 1300 lbs. on a single wire and 3 tiers high when Carla then stood up on a chair to top the act off. I had the pleasure of working with them along with many other circus greats. The fond memories of my time with the Cole Brothers/Clyde Beatty Circus though short, are many. I wondered then how much longer it would last, now I know … 54 years. I was 26 then. The world is moving much faster than I expected, or am I just moving slower? Hello Brother. 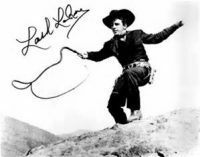 It is not surprising to me that we both liked Lash LaRue. We do have a lot in common. I knew you would resonate with the closing of the circus, since you spent some time working in that environment. Always good to read your comments. Thanks. 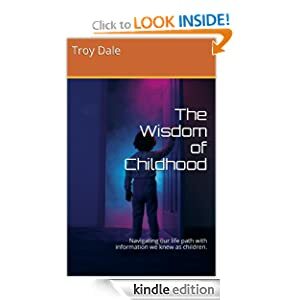 Great post, Troy; it brought back happy memories. I’ll never forget my first circus. I was engrossed, amused or frightened every moment; and it was the first time I remember eating cotton candy. My small town still has an ice cream truck in the summer and a carnival that stops by; and the next town over still has a working soda fountain. 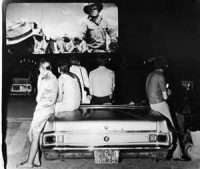 But our drive-in movie screen now edges a gravel pit and the back is adorned with a huge banner showing scenic spots in the area and welcoming folks to town. I miss the smooth, clicking noise of hand-pushed lawn mowers, as long as someone else is doing the pushing and the shiny, colorful aluminum tumblers that made every beverage taste colder. Where is your small town? I want to live there. I can remember pushing a lawn mower and even trimming the edge of the lawn by hand. These are not fond memories. Thanks for the comment.